1 Bedroom Upper Floor Flat For Sale in Luton for Offers Over £120,000. Commuters Dream! 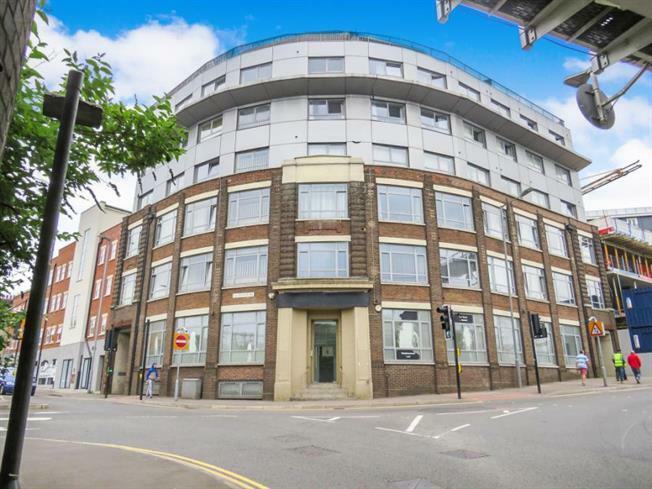 This chain free well presented studio apartment is conveniently situated in the heart of Luton town centre and is within a stones throw from Luton mainline station. The studio apartment is finished to an exceptional standard that includes a spacious living/bedroom area, modern fitted kitchen and a large modern bathroom. This unique apartment also benefits from stunning views overlooking Luton and if you wish to take the lift even further you will enjoy a stylish roof terrace, covering the whole of the building on the 7th floor that also offers stunning views over a beautiful skyline..
Wood effect flooring, double panel radiator, double glazed window to front aspect, telephone point, television point and broadband point. Fitted with a range of wall and base units with roll top worksurfaces over, stainless steel sink with mixer taps over, tiled splash back areas, fitted cooker with fitted hob and extractor hood over, fitted dishwasher, fitted washing machine and fitted fridge/freezer. Low flush WC, vanity unit with wash hand basin, tiled splash back areas, panel bath with mixer taps and shower attachment over, heated towel rail and extractor fan to ceiling.